Why you should be concerned about NON-NATIVE INVASIVE PLANTS? Alien invasive plants rank as one of the primary threats to native wildlife and natural ecosystems world wide. They also are a direct threat to your lands ecological health and economic value. Failure to control invasive plants leads to invasive monocultures that degrade the aesthetics of your property and reduce its property value. Taking action now prevents a larger problem from developing in the future. The biggest fallacy is that Non-native Plants provide food and habitat for wildlife. That statement is completely false. Non-native invasive plants do not support native wildlife the same way native plants do. It is imperitive that invasive plants be controlled and eliminated to maintain healthy populations of song birds, butterflies and all other types of wildlife we enjoy. Labor rate for invasive plant control $50 per hour. On average it takes 2 to 4 hours per acre, to control woody invasive plants like: Common buckthorn, Glossy buckthorn, Asian honeysuckle, and Autumn olive. An investment in control now pays big dividends over the long term. It will reduce or eliminate the impact of invasive plants on your property for many years to come and save time and money in the long run. Most infestations have been developing for 30 to 50 years. A few hours spent today can reset the clock to an earlier time before invasive plants. Cut stump treatment is the most effective method for controlling large woody plants. Stems are cut off at the ground level and the cut surface is treated with a herbicide. Most shrubs commonly resprout from the roots without treatment. This method provides permanent control and uses the least amount of herbicide. A moderate infestation of buckthorn will take 2 to 4 hours per acre to cut and treat. I have been working in the field of invasive plant control for many years, working with State and Federal agencies, not for profit groups as well as private landowners. A quick inspection of your property will determine what Invasive Plants are present on your porperty, how big the problem is and the best course of action to control each one. Each invasive plant requires a different strategy for control that is specific to that plant.The most cost effective and reliable control methods are used to get the job done quickly and efficiently. Invasive plants (IP) are a threat to your property for several reasons. Invasive plants have certain characteristics that allow them to out compete and displace native plants by direct competition for nutrients, sunlight and growing space. They have enormous capacity to reproduce and spread both by seed and root sprouting. They have no natural pests to limit their population growth, reproduction and spread. Invasive plants have the ability to grow almost anywhere under any condition. Over time they form large monotypic stands that prevent any other plants from growing. All of these advantages allow invasive plants to dominate their surroundings to the exclusion of native plants. The only permanent control method for the majority of invasive plants requires the limited use of a herbicide. There is no permanent or cost effective alternative. A low toxicity, non-persistent herbicide is used. W.O.N is certified by the state of New York to apply pesticides. Prevention is far cheaper than eradication. It is never too early to start. Invasive plants often go undetected until the infestation gets out of control. Infestations usually start out as small populations that go unnoticed but continue to grow and spread. Then suddenly the population can seem to explode. Periodic monitoring can detect invasive plants before they can get established and dominate. It is far easier and cost effective to eradicate a small infestation before it spreads. With a little training you can monitor and keep you property free of undesirable invasive plants for the future. You will be shown how to identify invasive plants and monitor your property to prevent reinfestation, and how to control any that may show up. All higher organisms are dependant on plants for their very survival. The plants at the base of the food web provide food for all the other higher organisms higher up the food chain. Plants convert the sun's energy into plant tissue which is then converted into animal protein by plant eaters (herbivores) primarily by insect herbivores. The insect herbivores are in turn eaten by other organisms, such as other insects, birds, amphibians, and mammals. Not all plants are equal when it comes to their ecological value. Only native plants that have evolved side by side with native organisms are able to provide them with what they need to live. Most insect herbivores are plant specialists that have evolved to feed on just a few species of Native plants. They cannot feed on or complete thier life cycle on any other host plant. The more Non-native plants there are on your property, the fewer native insects there will be, that can feed on those plants. Consequently there will be fewer birds, butterflies and other animals that you want to encourage. Autmn olive before and after treatment . This field took little more than an hour to cut and treat. Small woody plants and perrenial invasive weeds are best controlled by using foliar sprays. This method is very cost effective for treating large areas and large numbers of plants. Fields infested with small shrubs can be treated in 1 to 2 hours per acre. 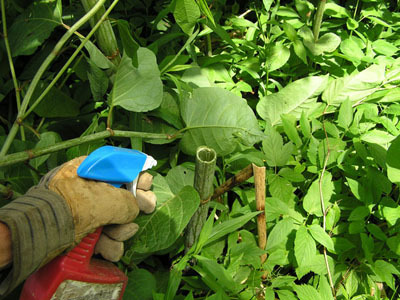 Japanese knotweed can be controlled by cutting and treating the hollow stem or using a stem injection method, shown here. Herbaceous invasive plants cause extensive damage to native plant communities everywhere. They crowd out native plants, contribute to loss of habitat resulting in fewer birds and wildlife. They are extremely difficult to eradicate once established but the effort must be made. I use the best control methodologies available to control each species.